How do I become a Heller’s Gas customer? Whether you’re interested in making the switch to Heller’s Gas or planning to use propane for the first time, signing up is easy! Simply click the Become a Customer button at the top of the page or call 1-800-422-0560 to speak with a member of our friendly and courteous customer service staff. How do I find my local Heller’s Gas branch location? Heller’s Gas provides a convenient tool on the Contact Us page of our website to determine the nearest branch based on the zip code of the property being serviced. Normal hours are Monday through Friday, 8am to 5pm and Saturday, 8am to 12pm. We also offer 24/7/365 emergency service. If you are looking to schedule a delivery, view previous deliveries, check your outstanding balance, or pay a bill, we invite you to log onto our customer portal by clicking the My Account button at the top of the page. Here you can perform all of these tasks from any device, anytime, anywhere! Is propane a safe and clean fuel? Propane has a remarkable safety record, due in large part to the stringent codes and regulations developed by the propane industry and the National Fire Protection Association (NFPA). Statistics compiled by the NFPA indicate that the safest way to heat is with gas. Clean burning, safe, and economical, propane fuel has long been recognized as “green” energy. Switching to propane can help cut emissions and protect the environment! Is there a tank rental fee? NO – We do not charge a tank rental fee for using our company-owned tanks. When should I request a delivery? The answer to this question depends on which delivery option you have selected. If you are a will call customer, a fill should be requested once your tank reaches 30% to allow enough time for a delivery. Deliveries can be requested using our convenient online portal or by calling your local office. If an emergency or expedited delivery is required, additional charges may apply. If you are enrolled in our automatic fill program, normally there is no need to call for a delivery as we monitor your fuel usage and schedule fills as needed. 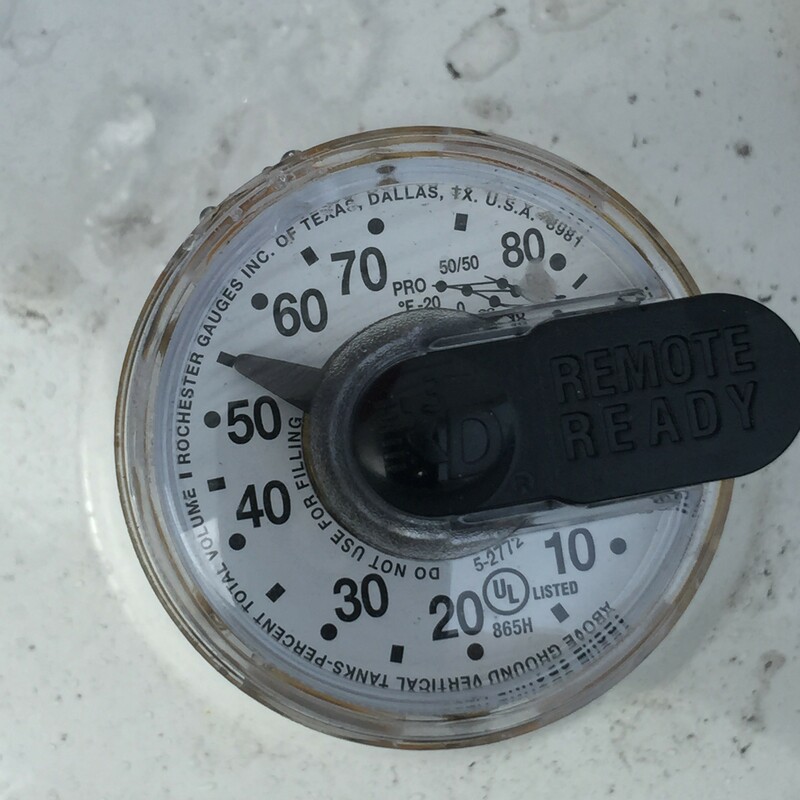 Regardless of your selected delivery option, it is important to continually monitor your tank level to prevent runouts. If you tank reads 5% or below, contact your local office for a delivery as soon as possible. Checking your propane level is as easy as checking the fuel gauge in your vehicle! Simply open the lid of your tank and look for the round dial. This gauge measures the percentage of fuel left in your tank. Because we have to leave room for expansion, 80% is considered a full tank. If your tank level is below 20%, click the My Account button at the top of the page or call your local Heller’s Gas store to schedule a delivery. Why was my tank not filled to 100 percent? For safety, propane tanks are only filled to 80% of their total capacity. This preventative safety measure allows for fluctuations that happen inside a container. These fluctuations occur as propane, much like water, will expand when heat is introduced. Propane however increases in volume almost 17 times greater than water over the same temperature increase! By only filling tanks to 80%, we are allowing for extra space to account for this expansion. How do I maintain my tank? For company-owned tanks, Heller’s Gas will keep your tank and propane system in working order, however we do ask that you keep grass and brush from growing up and around your tank and clear any snow or ice accumulations. For both company-owned and customer-owned tanks, we ask that you maintain an unobstructed path from a vehicle access point to your tank to allow for deliveries. Do I have to be present for a delivery? NO – As long as our driver is able to get to your tank to fill it, you do not need to be present during a delivery. Please be sure that there’s a clear path to your tank, the area around the tank is free of brush and debris, and pets are either inside or secured. What taxes and additional fees can be charged? Heller’s Gas is required by law to assess sales tax based on customer and usage criteria per state-imposed regulations on a state-by-state basis. If you are being charged sales tax and feel you qualify for tax-exempt status, please contact our Accounts Receivable department at (570) 752-8451 as Heller’s Gas cannot determine the tax status of its customers. As detailed in our customer agreement, we reserve the right to charge certain fees in connection with the delivery of propane or collection of balances owed. These fees are not government-imposed and are set and enforced by Heller’s Gas in its discretion. Some of the most common fees are listed below, however not all fees may be applicable to you depending on your service type, location, and other factors. HCIC – This hazardous communication charge is sometimes also known as a hazmat fee and is assessed to help us cover the cost of ensuring the safety of both our customers and employees through training, communication, equipment, and other measures. Minimum Use Fee – This fee is charged when a customer is using a company-owned tank and does not meet the required minimum number of gallons to be delivered annually. The charge helps to offset the cost of equipment and required maintenance of that equipment. Off Route Delivery Fee – This fee is charged when an emergency delivery is requested and must be made outside of a planned driver route.